He is as strong as a lion and as smart as a fox but also as heavy as a rhinoceros. So when Rhino Hero is around even the most robust tower may start to wobble. Can you help Rhino Hero accomplish his wobbly construction mission? 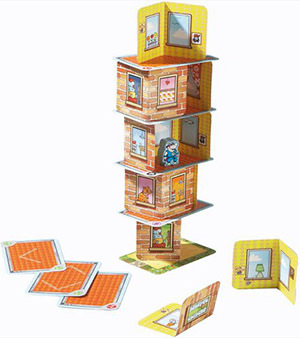 Together you build a house of cards, floor by floor, as tall as you can for Rhino Hero. Just like a real house it is made up of walls and ceilings. As you never know how tall it will become the ceilings look like a roof. The marks on the roof determine how the walls of the following floor have to be erected, and the symbols on the roof determine certain building conditions, which might mix things up a bit. The aim of the game is to be the first to have placed one's roof cards. Place the foundation with either side face-up in the center of the table. Shuffle all roof cards and distribute five to every player. If you are only two players each player receives seven roofs cards. The remaining roofs cards are put in a provision pile away from the foundations. Get the walls and Rhino Hero ready. Play in a clockwise direction. Whoever has done a good deed most recently may start. If you cannot agree, the youngest player starts and tries to build one of his roofs cards. But before you can do so you have to build the floor, with one or two walls. Have a look at the marks on the foundation or on the last roof card that has been placed. The mark shows the number and position of the walls for the new floor. Take the required wall(s) and bend it/ them to the necessary angle. Now position it/them and place one of your roofs cards on top. Continue playing but in the opposite direction. If there are only two players this symbol is of no importance. The next player has to take a rest and lose a turn. It's then the turn of the next player. If you are two players, it's immediately your turn again. The next player has to draw a new roof card from the provision pile before starting to build. This card allows you to place a second roof card on top of this one. However you may not place a second double roof card on top of a double roof card. If you do not have any regular roof cards to use as your second card, then you ask your neighbor to the left to pass you one of his roof cards; of course this helps your neighbor get rid of one of his cards. 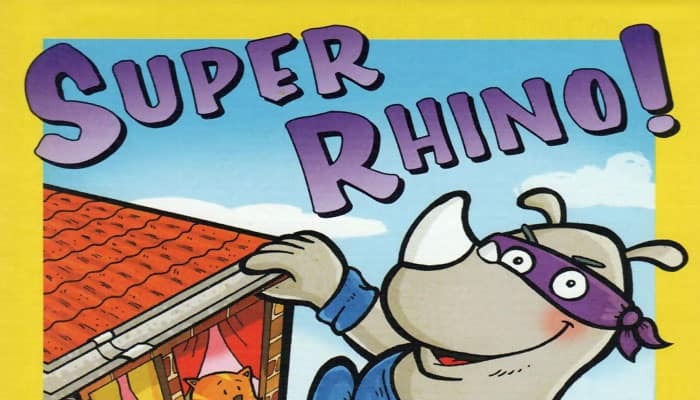 Rhino Hero is climbing again! The next player has to move Rhino Hero from where he is to the new Rhino Hero mark. Only then may he place a roof card on the floor. Then it's the turn of the next player. You can use both hands for stacking. You may touch only the wall or roof card you are placing. 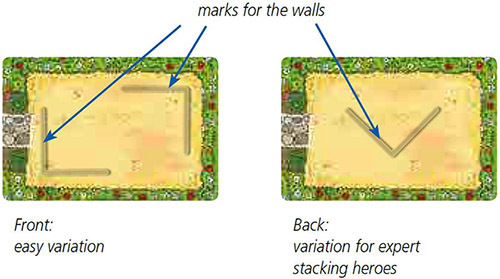 Position the walls as exactly as possible on the marks. The roof card must be positioned the same as the foundations. Ideally the double roof card should be played as the second to last roof card in your hand, if you play it as your last card you are still the winner, but can help your neighbor by placing one more card on top of the double roof card. a player has built his last roof card. He has super house building powers and wins the game. The player who made the house collapse loses the game. The player left with the fewest roofs cards wins the game. In case of a draw the player with the most special symbols on his remaining roofs cards wins the game. If there is still a draw those players win together. all the walls have been build in. In this very unlikely case you are the super heroes and win together.